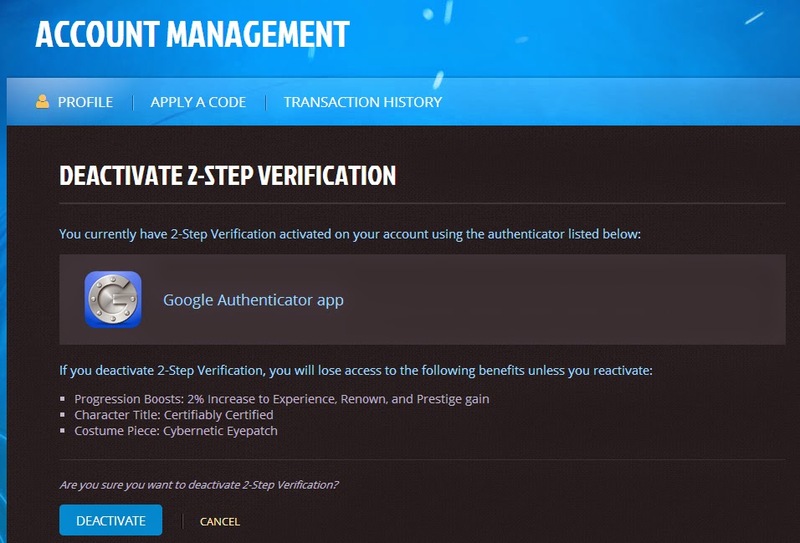 Nexus Nightly: 2-Step Verification ---- uhhhh whaaa? 2-Step Verification ---- uhhhh whaaa? Head Start & Launch has been great so far! I think we both feel pretty good about joining Chili & Cornbread. It's a friendly guild, nice and reasonable people. We also met up with an old WoW friend who joined us for the first bout of questing. A full post on this will come tomorrow. For now... one thing has me puzzled: the 2-Step Verification process. It's great that Carbine has set this up. When we first tried to log in at 3 AM, I didn't even notice the random ordered numbers on the screen. I just thought I was very tired and boy was that hard to do. But all is well and good and of course it's worth a little hassle to be more secure. Great. UPDATE: Okay, I just tried it and you can't deactivate the 2-Step Verification without having the code- BUT you can get into all my personal information including address and phone number. You can also adjust the subscription plans and do transactions of that nature. UPDATE #2: Been getting some messages about this. I am referring to the ability to sign into your Wildstar account [through the website] without the authenticator. The game itself has NEVER failed to veryify me. I assume that the purpose of the authentication process is to thwart a malicious person (who has already gained a player's username and password) from doing harm to that player's account. Yeah I was just surprised that you can access a lot of account stuff without the authenticator. Seems like the correct action would be to force players to authenticate when they log into their accounts just like they have to with the game.